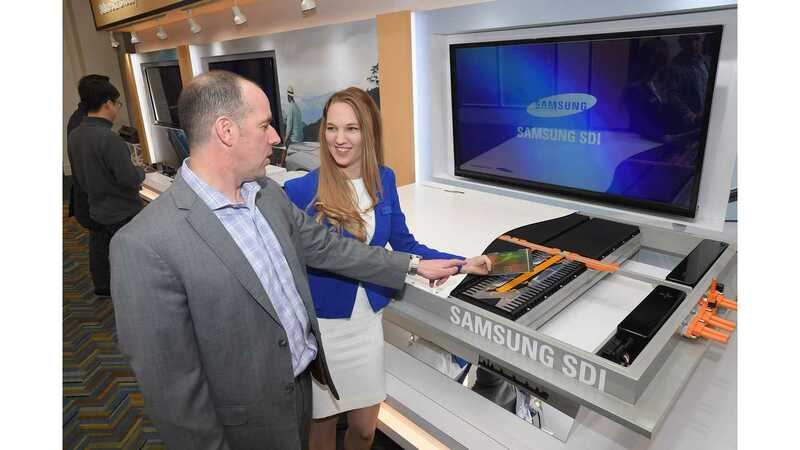 Samsung SDI presents at the North American International Auto Show all sorts of battery products under its "The Future of Electric Vehicles Starts Today" slogan. Samsung SDI exhibited a brand new fast-charging, high-capacity battery material as well as cutting-edge battery products for electric vehicles at 2018 Detroit Motor Show. The key promise is new batteries that enables 600 km (373 miles) range and at the same time 20-minute recharge, which to our knowledge would require power of 300 kW or so. Prismatic cells, modules and packs. "Samsung SDI is capable of unparalleled product competitiveness with a lineup of various battery cells for electric vehicles (EVs) and plug-in hybrid electric vehicles (PHEVs) which come in 37, 50, 60 and 94 ampere hour capacities. The lineup is highlighted by battery cells with energy densities high enough to propel EVs as far as 600 kilometers after just a 20-minute charge. Also Exhibited will be modules and packs utilizing these innovative battery cells demonstrating Samsung SDI’s capabilities as total solution provider." Graphene balls - the new technology from Samsung Advanced Institute of Technology (SAIT) that increases capacity by 45% and charging speed by five times through graphene–silica assembly, called a graphene ball. "In addition SDI will highlight the recently introduced battery technology of “graphene balls,” a unique material that enables a 45 percent increase in capacity and five times faster charging speed." "The development of “graphene balls” by a team of researchers at the Samsung Advanced Institute and Technology was covered in the November 2017 edition of the science journal Nature Communications." Solid-state batteries - Samsung SDI is developing also those. "SDI will also be showing their latest effort with “solid-state batteries,” a technology which has improved both the capacity and safety of SDI’s batteries." "Samsung SDI also showcased various battery products, which will draw interest from automakers that want EV batteries tailored to their specific needs. Multi-Functional Module Battery Packs of Samsung SDI allow users to adjust the number of modules to capacities they need and thus to diversify driving distances capabilities. These packs are expected to catch the eyes of automakers that want to make vehicles with different ranges by using a single pack as the foundation for an entire vehicle platform." 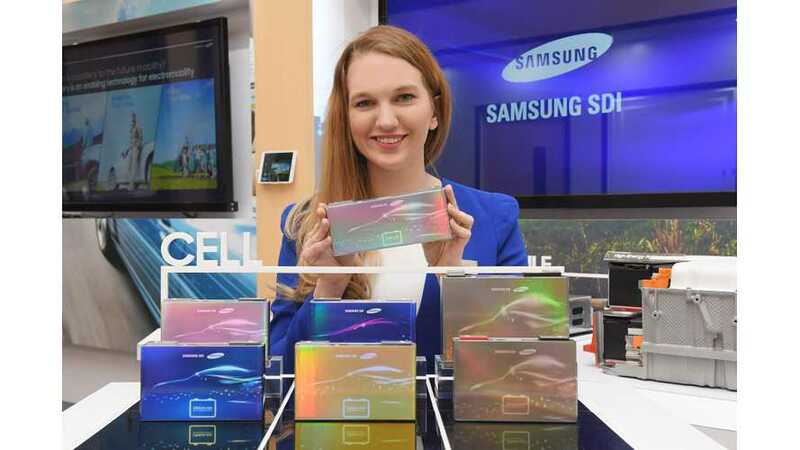 "Another groundbreaking Samsung SDI product exhibited at the show is the “Low Height Cell.” This is a cell whose height has been reduced by more than 20 percent from existing cells. By using this cell design the automotive companies can increase the interior space of an EV and increase design flexibility for the vehicle overall." "Samsung SDI also displayed cells and modules based on the new 21700 standard cylindrical battery. A ‘21700’ battery is 21 millimeters in diameter and 70 millimeters in height with capacity that is 50 percent larger than 18650 battery technology. Its size is optimal for maximizing power output as well as battery life. A 21700 battery has come into the spotlight as the next-generation standard for applications in Energy Storage Systems (ESS), electric power tools and electric vehicles."